 These “flowers” are simply polka dots pulled together with a toothpick (see the video below; photo courtesy Gardenia | NYC). 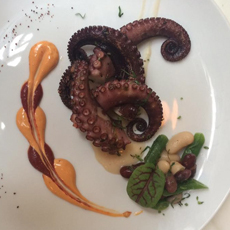 Any food that isn’t made in a sauce can be decorated (photo courtesy Shalit Foods). 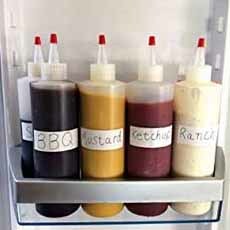 Keep your favorite sauces in the fridge, ready to squeeze (photo courtesy Pure Joy Concepts). You can buy sauces or make them (photo courtesy Melissa’s). When you get your food at a good restaurant and the chef has made beautiful chevrons, flowers or hearts from the sauce, are you impressed? If so, know that some of these are so easy, that all you need are a couple of squeeze bottles and a toothpick or skewer to make them at home. 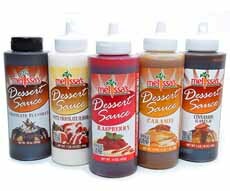 In fact, the hardest thing to do is to decide which sauces to use with your dish. Start with polka dots of sauce before moving into more complex designs. 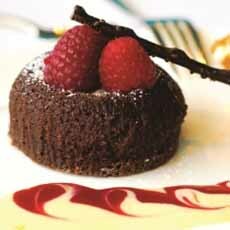 Look for the color impact as well as the flavors when you select sauces. The lists below are just guidelines. You can use whatever goes through a squeeze bottle (but steer clear of sauces with inclusions—bits of dill, mustard seeds, etc.). *Coulis (COO-lee) is a sauce made from puréed and strained vegetables or fruits (i.e., no seeds remain). This video shows three easy techniques for both sweet and savory sauces.